Bureau of Reclamation releases projections of Lake Powell and Lake Mead for next five years. With the depressed snowpack and warming conditions, experts indicate that runoff from the Rocky Mountains into Lake Powell this spring will yield only 42 percent of the long-term average. Hoover Dam with Lake Mead's elevation at 1088.14 feet above sea level. We all—states, tribes, water districts, non-governmental organizations—have an obligation and responsibility to work together to meet the needs of over 40 million people who depend on reliable water and power from the Colorado River. 2018 has brought record-low snowpack levels to many locations in the Colorado River Basin, making this the driest 19-year period on record. With the depressed snowpack and warming conditions, experts indicate that runoff from the Rocky Mountains into Lake Powell this spring will yield only 42 percent of the long-term average. With drought and low runoff conditions dating back to 2000, this current period is one of the worst drought cycles over the past 1,200 plus years. Water stored in Colorado River reservoirs during prior years of plentiful snowpack and runoff has helped ensure continued and reliable water and power from Reclamation infrastructure. Reclamation reservoirs were nearly full when drought conditions began in 2000 providing ample water supplies that have carried the Basin through this period of historic drought. 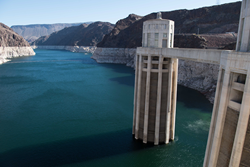 Voluntary water conservation efforts taken by Reclamation, the seven Colorado River Basin states, water districts and Mexico have stabilized the decline of Lake Mead – delaying the onset of reductions to water users in Arizona, Nevada, Mexico, and ultimately California. But these efforts by themselves would not protect Lake Mead and Lake Powell if drought conditions persist. The infrastructure built by prior generations is working, but the best information available shows a high likelihood of significant water reductions in the Colorado River Basin in the years ahead. Concerns are increasing as forecast models predict a 52 percent chance of shortage conditions at Lake Mead beginning in 2020, with a greater than 60 percent likelihood of shortage thereafter. Over the past decade, the risk of declining to critical reservoir levels has approximately tripled. Following strong calls for action in 2017, Reclamation Commissioner Brenda Burman is focused on the increased risk from another dry year in the Colorado River Basin. She noted that there is no indication that the current low runoff and drought conditions will end anytime soon. She emphasized that the extended drought and increased risk of crisis in the Colorado River Basin requires prompt action. "We need action and we need it now. We can’t afford to wait for a crisis before we implement drought contingency plans," said Reclamation Commissioner Burman. "We all—states, tribes, water districts, non-governmental organizations—have an obligation and responsibility to work together to meet the needs of over 40 million people who depend on reliable water and power from the Colorado River. I’m calling on the Colorado River basin states to put real – and effective – drought contingency plans in place before the end of this year." In 2017, the United States and Mexico agreed to a new strategy that would lead to increased savings of water by Mexico, but that agreement will only go into effect if the Lower Basin states of Arizona, California and Nevada finalize their drought contingency plan. "Adoption of additional water conservation measures now is the best approach to protect Lake Mead as we continue to work on long-term solutions," said Lower Colorado Regional Director Terry Fulp. Upper Colorado Regional Director Brent Rhees added, "We’ve weathered the past two decades of drought thanks to our water storage infrastructure. Completing drought contingency plans will provide better certainty for continued reliable water and power." Pat Tyrrell, Wyoming’s State Engineer stated: "This is a critical juncture and we must complete drought contingency plans in both the Upper Basin and the Lower Basin prior to crisis. Further delay is not an option, and I have to believe we can get to 'yes.' Full implementation of Minute 323 with Mexico is only possible when the drought contingency plans are complete, and with Lower Basin shortages likely by 2020, we have no other palatable solution." "Colorado is heartened by Commissioner Burman's call to action, stands at the ready to move drought contingency planning forward, and agrees that the situation is urgent. Paraphrasing Ben Franklin, the states must hang together or we'll hang separately," said Colorado's James Eklund. "With the threat of this unprecedented drought continuing, the Colorado River Basin States and Mexico need to complete drought contingency planning efforts in the near future. We need the participation of all these parties in order to ensure this goal’s accomplishment. It has never been more important to work together," said Eric Millis, Director of the Utah Division of Water Resources. "New Mexico believes that drought contingency plans are a key step to surviving this exceptional drought. Now is the time for us to come together and establish a path for the future of the Colorado River Basin," said Tom Blaine, New Mexico State Engineer. "This ongoing drought is a serious situation and Mother Nature does not care about our politics or our schedules," said John Entsminger, Southern Nevada Water Authority general manager. "We have a duty to get back to the table and finish the Drought Contingency Plan to protect the people and the environment that rely upon the Colorado River." California’s Colorado River Commissioner, Bart Fisher, stated that, "California’s Colorado River agencies recognize the continuing poor hydrologic conditions within both California and the Colorado River Basin, and remain fully committed to collaborate with our partner states in completing the Lower Basin Drought Contingency Plan and ensuring activation of the Mexican Binational Water Scarcity Contingency Plan contained within Minute No. 323." "The completion of the lower basin states’ Drought Contingency Plan is vitally important to Arizonans. The plan reduces the likelihood of Lake Mead declining to critically low levels and incentivizes the use of tools to conserve water in the Lake so that reductions in delivery of Arizona’s Colorado River supplies are avoided or lessened," said Thomas Buschatzke, Director of the Arizona Department of Water Resources. In addition to Reclamation's ongoing work with the Colorado River Basin states, it also coordinates with the Upper Colorado River Commission. Felicity Hannay, Chair of the Upper Colorado River Commission, said that "The Commission takes the position that implementation of drought contingency plans in both basins is critical to get us through this dry spell." Projections of Lake Powell and Lake Mead operations for the next five years can be found at https://www.usbr.gov/lc/region/g4000/riverops/crss-5year-projections-APR2018.html.